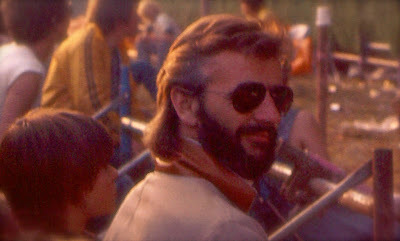 Ringo on July 15, 1978 during a special event at his son, Zak's school. Unfortunately on July 15, 1980, Ringo was in Nice, France recording with Paul & Linda. This kinda looks like Ringo in 1979 so maybe they were a year out? Certainly not post 1980. Upon further investigation I have found out this was indeed July 15, 1978 and was not taken at Zak's school although Ringo had visited there earlier in the day. This was later that afternoon at “The Picnic at Blackbushe Aerodrome” in Camberley, Surrey, England. Ringo was there to watch both Eric Clapton and Bob Dylan perform. Ringo was accompanied by Bianca Jagger! Very good information and research, Hitachi! This photo was taken at the school event. ringo seems to be wearing the same jacket.